About 1 year ago, I was searching the Internet for a solution to a Microsoft exchange 2000 problem I had. After searching google for hours and looking at various tech. 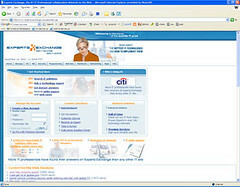 sites, I ended up on a site named Experts-Exchange.com (EE). In the last few years, google often pointed me to this site, but unfortunately, I could never access it because a premium membership was required to look at the various solutions. One day, I decided to simply register on their website to check out what was available to free members. To sign up, simply head over to experts exchange, and click on the sign up link (edit 2006/01/26, use this link, they changed the procedure to sign up, and the link is pretty hard to find on the page). Fill in the member information without entering any credit card information and click submit. At that point, you still won't have access to the knowledge base, but there is a free way to get it: become and expert yourself! Just browse the unanswered questions, and try to answer a few of them. All you need to do is get 10,000 expert points, the equivalent of about twelve questions to get your free premium membership. EE has over 200 topic areas where you can show your expertise, so if you have any technical knowledge about any information technology field, I'm pretty sure you can get that free membership quite easily. When you finaly get to that point, you'll be required to earn at least 3000 points per month, which is pretty easy to attain. On my best months, I used to get around 100000 points. EE also offers you some basic certification in the fields where you excel. 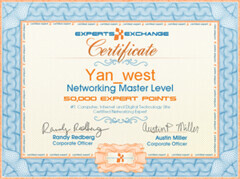 All you need to do is accumulate 50000 points in a given area and you get your certification. After doing all of this, EE gives you access to their complete database of solutions. the database contains over 1,426,721 searchable IT solutions with new solutions added every day. You can even ask your own questions when you cannot answer them yourself. There are A LOT of active members on there, so you do not have to worry about not getting an answer. If you cannot earn the membership, you can always purchase it for 9.95$USD per month. A real bargain when you consider how much this will make you save. In truth, to -see- an article solution, you don't even need an expert account, just a free account. Sometimes even if you're not even logged in they'll give you a solution to whet your appetite! Hmmm, Some solutions arent available to regular members, I tested it out, you need premium membership, only the solutions that appears in the "Hot Solution" or "Time tested solutions" are free. Doesn't appear to work. There's no free account creation, and if you don't enter a credit card number, you get an error. Hey Mr. King lives, thanks for letting me know, EE changed their sign-up procedure, and my instruction werent working anymore. I made the correct modification to the sign up link. This will pull essentially the same results of querying the experts-exchange website. This is all fine and good. Next you click a link and you are asked to pay up if you don't read the next part of this comment. You should NOT click on the actual article link on google, rather, you should click on the google cached view of the same page you are trying to get to. The google cache for some reason or another is good and will load without any password prompts. Actually there is a way to see all answers.. I found it only works with IE tho but its rather simple. Right click and select all text, then paste into notepad. All answers including the "accepted solution"
Yeah, the easiest way I've found with EE? Scroll down. way down. past the end of the solutions in gibberish, past the "end" of the page. All the solutions are there in plain text. Right after the "Zones" section.